SALT LAKE CITY -- As Utah waits to see if President Barack Obama will designate a new national monument in the state, this weekend’s 20th anniversary of another national monument rekindled memories of an event that ignited simmering western frustrations about federal ownership of public land. President Bill Clinton created the Grand Staircase Escalante-National Monument on Sept. 18, 1996, by signing a declaration at the south rim of the Grand Canyon in Arizona. It was lauded by environmentalists, with actor and Utah resident Robert Redford appearing at the ceremony with Clinton. But in heavily Republican Utah, the move was viewed as a sneaky, stab-in-the back example of federal overreach. 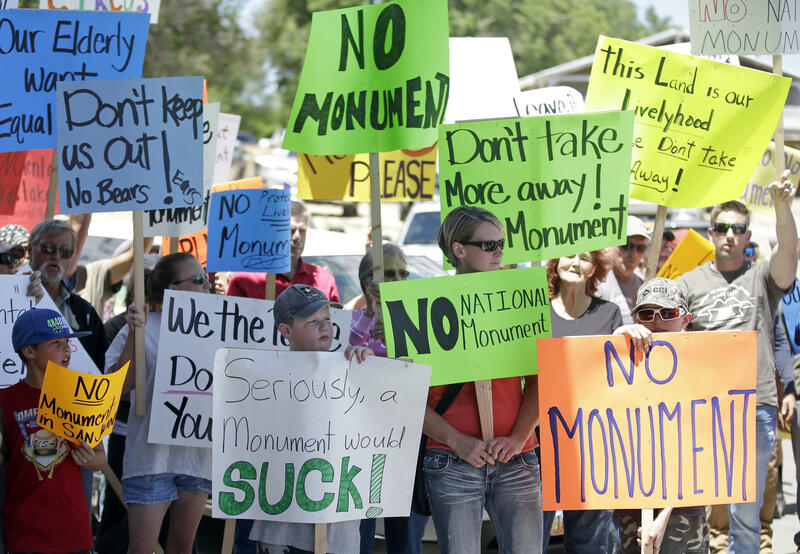 The monument and the way it was created remain a sore spot for many Utah Republicans and local residents, who say it closed off too many areas to development -- including one of the country’s largest known coal reserves -- that could have helped pay for local schools. They also argued it was too large -- enveloping about 1.9 million acres -- the largest national monument in the contiguous United States and an area about the size of Delaware. Many of those same people who now oppose the proposed Bears Ears National Monument in southeastern Utah cite Grand Staircase as proof of why monuments are bad news for rural residents. In 2015, Garfield County declared a state of emergency for falling school enrollment, and county commissioners laid some of the blame on Grand Staircase. “That is the worst thing that has ever happened to this county,” Garfield County Commissioner Leland Pollock said Friday. Pollock said the monument put the kibosh on a planned coal mine that would have brought 1,100 jobs to the area. Tourism to the monument has only created seasonal, low-paying jobs and families have moved away, Pollock said. “You can’t do anything on a monument,” he said. State tourism officials and conservation groups tout the monument’s natural wonders, and a record number of 900,000 people visited its scenic cliffs, canyons, waterfalls and arches last year, according to the monument’s federal managers. The monument deserves to be hailed as a high-water mark in conservation, said Steve Bloch of the Southern Utah Wilderness Alliance. Past presidents who created monuments that later became Zion and Arches National Parks were commended for their actions, Bloch said. “These are federal lands, and this was a step made on behalf of all Americans,” Bloch said. A poll conducted this summer by Benenson Strategy Group, a Democratic firm, and Public Opinion Strategies, a Republican firm, found Utah voters believe the monument has been good for the state by a two-to-one margin. More than half view it positively compared with less one quarter who think it has been bad. The poll was commissioned by The Pew Charitable Trusts, an organization that supports the designation of the Grand Staircase monument and the Bears Ears proposal. The proposed monument at Bears Ears would be about the same size as Grand Staircase, spanning wide expanses dotted with ancient ruins, petroglyphs and stunning vistas. A coalition of tribes and environmental groups say the monument is needed to protect from looting and damage from off-road vehicles. Mr. Obama has not said if he will designate a monument around Bears Ears, a pair of twin buttes that sits on land considered sacred. Interior Secretary Sally Jewell toured the area this summer and held a public meeting, an indication that the administration is exploring the idea.